Just a quick share because this card is for Easter and that's only a few days away! 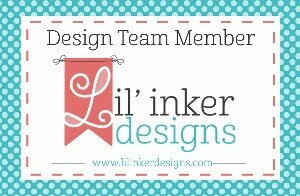 I've used the adorable Springtime Bunnies stamps from a new stamp company called Miss Ink Stamps. I started with the Halftone Bold Lines Center Stencil to create my plaid background. I rotated it to make a plaid! I white heat embossed the eggs and blended Distress Inks over them (emboss resist). After hand trimming the eggs, I arranged them across the card forming a border. I added a Copic colored bunny with foam adhesive and stamped the sentiment in the lower right corner with bold black ink. 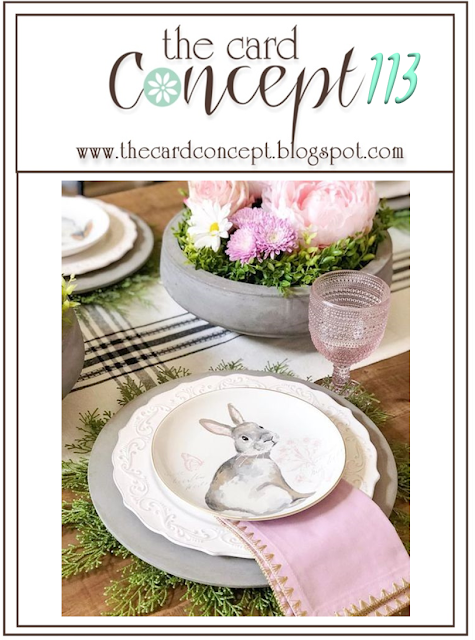 I was inspired by the challenge over at The Card Concept with the bunny, soft colors, and the plaid. Make sure to pop over to the Miss Ink Store to check out all the cute stamps they have! Hello! 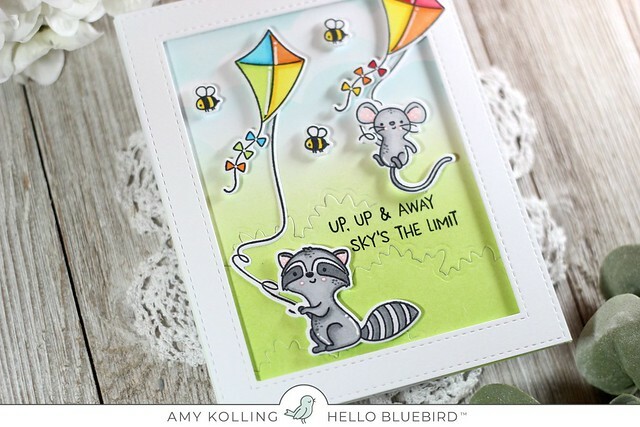 I'm here with a card using a small stamp set called You've Got This from Avery Elle. It has one large sentiment with many small supporting sentiments that can be used for many difficult occasions where you just don't know what to say. 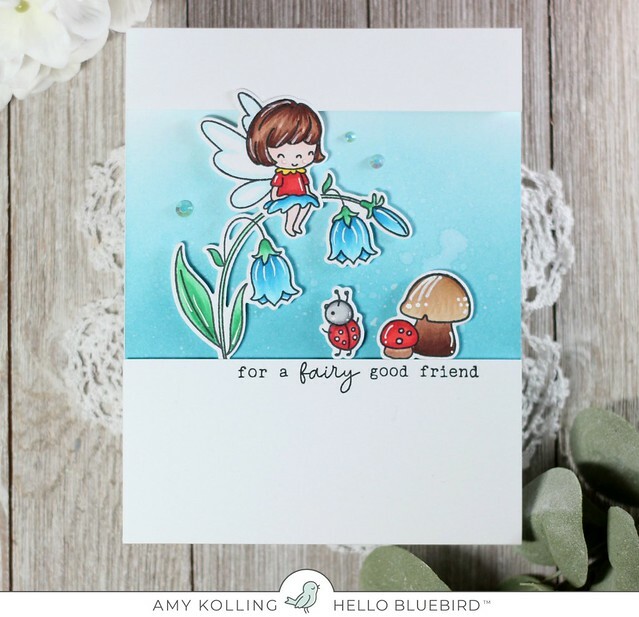 Welcome to Day 4 of previews and RELEASE DAY of the Hello Bluebird April release! All stamps and dies will be available tonight! 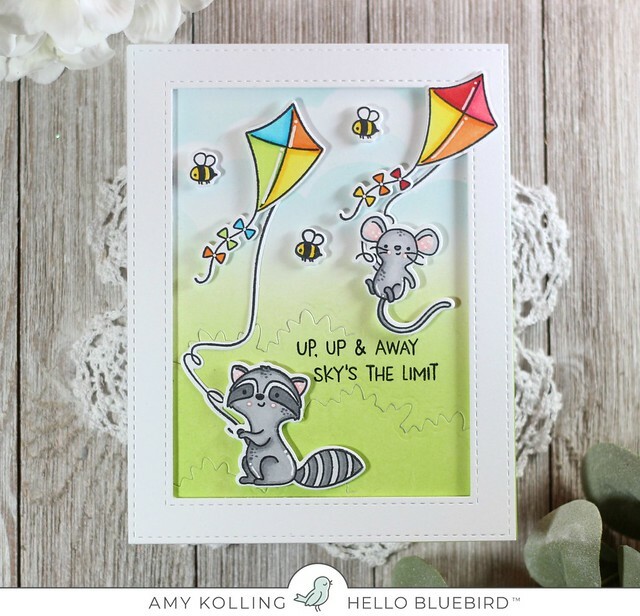 Today we preview Fly a Kite and it's coordinating Fly a Kite Dies. I created a scene using some Distress Inks to blend a sky using cloud border dies from Sunrise Scene Die. The grass "tufts" were done using the dies from the Pond Builder Die. The frame that outlines the scene is from Gallery Frame #1 Die. The adorable images were Copic colored and die cut. After arranging the scene, the sentiment was stamped in black ink in the open space. Adding all the images and elements with foam adhesive finishes the card! Thanks for sharing a part of your day with me! Don't forget, tonight is the time to SHOP!!! 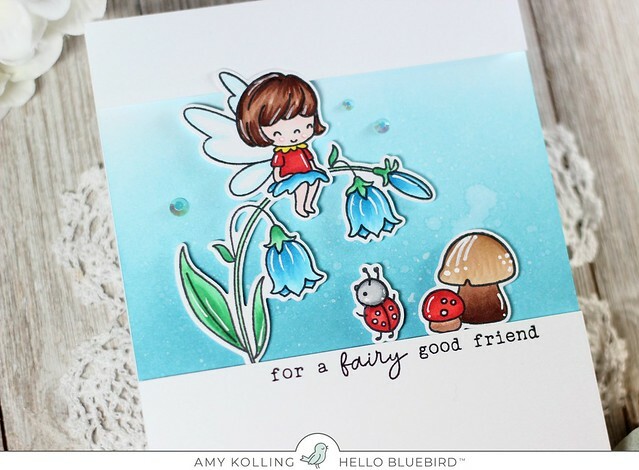 Welcome to Day 3 of previews of the Hello Bluebird April release! It's such a fabulous release!!! All stamps and dies will be available on April 16th. 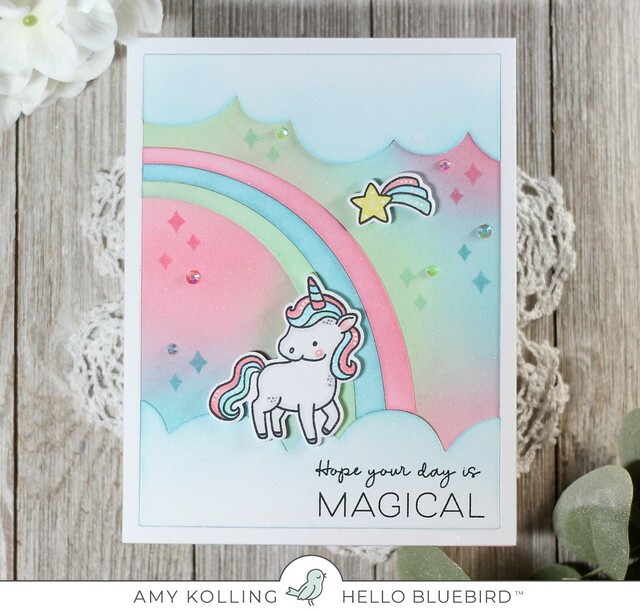 Today we are previewing several sets where the main theme is Unicorns and Rainbows. The core set is called Unicorn Tales. I've paired it with the After the Rain Scene Die. I started by ink blending some Distress Oxide inks onto Bristol Smooth Cardstock because I wanted a more "dreamy" look and the Oxide inks do this! (Cracked Pistachio, Worn Lipstick, Broken China) The After the Rain Scene Die was die cut and the individual pieces were ink blended with the same Oxide inks. The unicorn and shooting star were Copic colored and white details were added with a pigment pen. All pieces were added to the ink blended panel and onto a white notecard. A few diamond shapes were stamped in the same Oxide inks onto the panel. After the sentiment was stamped, the whole card was spritzed with my favorite shimmer SPARKLE spray from ImagineCrafts. Once the card was dry, a few coordinating gems were added. Thanks for sharing a part of your day with me and don't forget we still have one more day of previews left before release time! 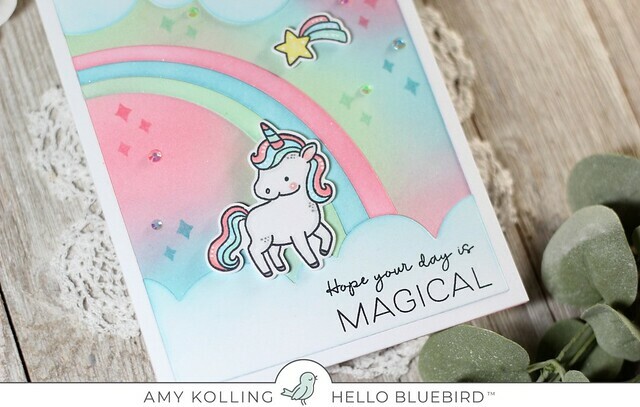 Welcome to Day 2 of the Hello Bluebird previews for the April release! The whole release will be available on April 16th. Today we are sharing THE cutest set called Maverick along with the Sunrise Scene Die. This set has an airplane along with four different critters you can have in the plane flying! The critter dies make a cut around their arm so that you can tuck them in the plane with their arm on the edge! The Sunrise Scene Die cuts a whole panel in pieces making it so easy to ink blend just the pieces you want. I started with my background. I die cut the Sunrise Scene Die out of white cardstock and ink blended the sun and rays with Mustard Seed and Squeezed Lemonade Distress Inks with a blender brush. The two cloud pieces were ink blended at the bottoms using Broken China Distress Ink. I stamped (by masking) the sentiment into the space on the clouds. My main images were Copic colored, die cut, and added to my scene with foam adhesive. As the final touches, white pigment pen was used to highlight areas of the images. Don't forget there are two more days of previews before the release!! 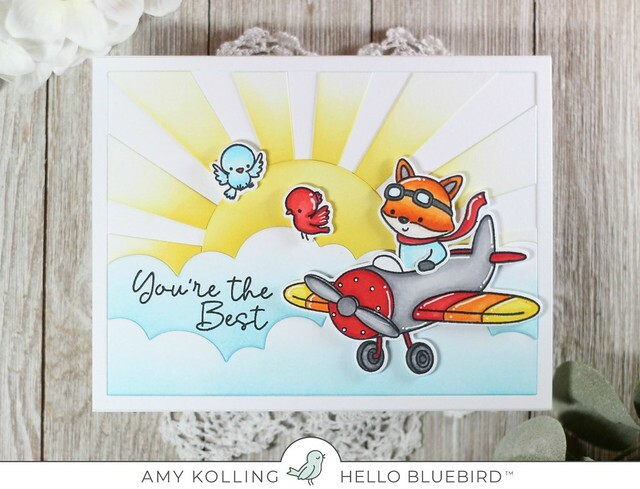 Welcome to the Hello Bluebird April release! This release is so fantastic and full of spring and new life! I'm starting things off with a card using Fairy Garden. T.his is a set with adorable fairies, bugs, and flowers. I created an ink blended background using Broken China Distress Ink and splattered it with water droplets. I added white panels to the top and the bottom stamping the sentiment on upper portion. The images were Copic colored, die cut, and added to the scene with foam adhesive. As last touches, white details were added with a pigment pen and some gems for sparkle. 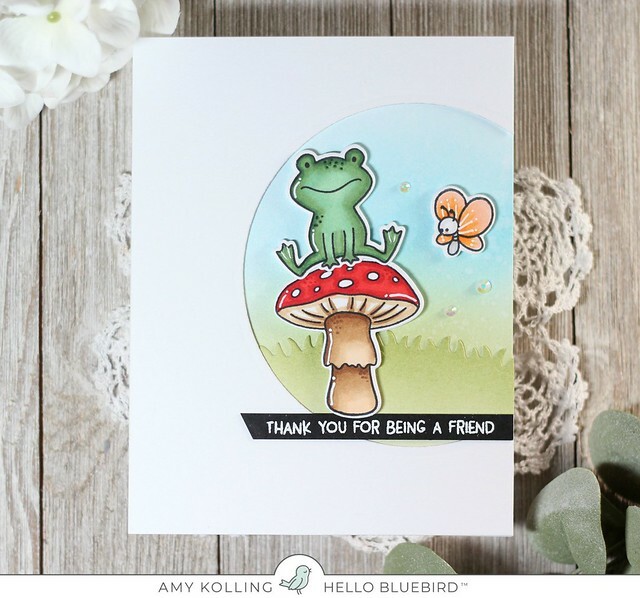 My second card uses Garden Friends. This card was ink blended with Broken China, Peeled Paint, and Shabby Shutters Distress Inks. To create a focal point, I uses a large circle die to cut out a portion of a white panel. I added some die cut grass just behind the circle cutout. The images were Copic colored, die cut, and added with foam adhesive. The sentiment was white heat embossed onto a black sentiment strip. To finish, a few white gems were added. Make sure to come back tomorrow as there is more cuteness coming from Hello Bluebird! 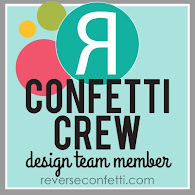 I am sharing a card for the Reverse Confetti.......Stock Your Stash Challenge! Each month is a new theme and this month we are showcasing Moms, Dads, Grads! The feather pattern paper in Free Spirit was perfectly masculine and ideal for my idea. 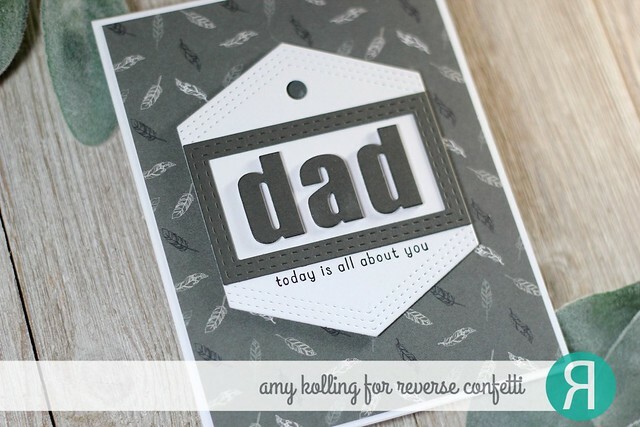 Using the 'DAD' Word Confetti Cuts, the word was cut once in Lead Cardstock and three times in white. These were all layered for dimension. 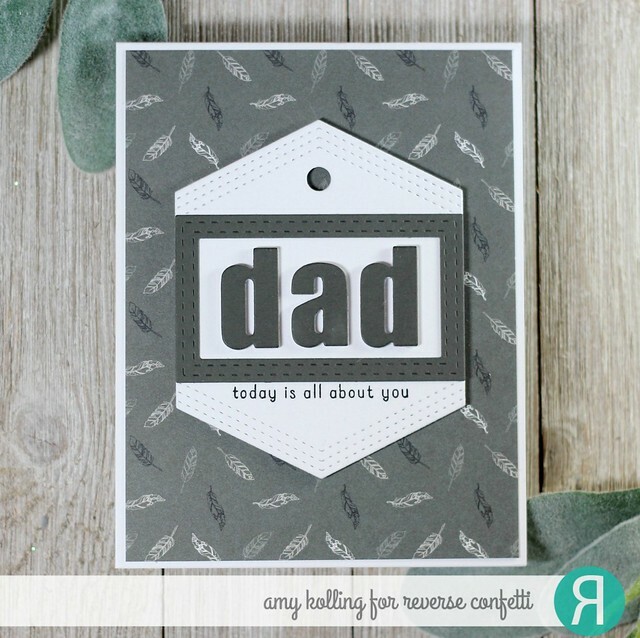 I wanted to layer my 'DAD' onto a Stitched Hex Tag Confetti Cuts done in white. To make the 'DAD' really pop, I added a frame out of Lead Cardstock (cut with the All Framed Up Confetti Cuts) that fit perfectly across the hexagon and left room to stamp a sentiment, from Word Up, underneath the frame. The hexagon shape was added to the paper lined notecard with foam adhesive. 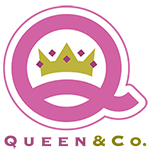 Make sure to go check out all the information on the Stock Your Stash Challenge over on the Reverse Confetti blog-------HERE!